Mary Mikawoz graduated from the New Media Specialist Program from Red River College and has been designing for over 10 years. Mary strives to produce creative work that meet's the client's individual project needs. She is approachable and personable Give her a call to discuss your advertising and marketing needs. 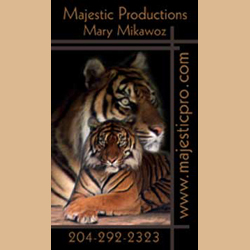 Majestic Productions has been in existence since the last millenium.